Well that was quite a bit of rain, 4.5 inches! We actually needed a good rain, maybe not that much but because we have somehow missed all of the big rains in the last month and have been pumping lots of water it was good to get, might be a bit muddy harvesting for market today. Cool the next few days, blackberry winter for sure and then probably right into summer conditions for the duration. Must be time to plant peppers. Running behind this week after my two day Rural Advancement Foundation International (RAFI) board meeting. There are a lot of good sustainable agriculture organizations across the country doing great work in all areas of farming to make the lives of farmers and agriculture in general better and we have worked with a number of them over the years. 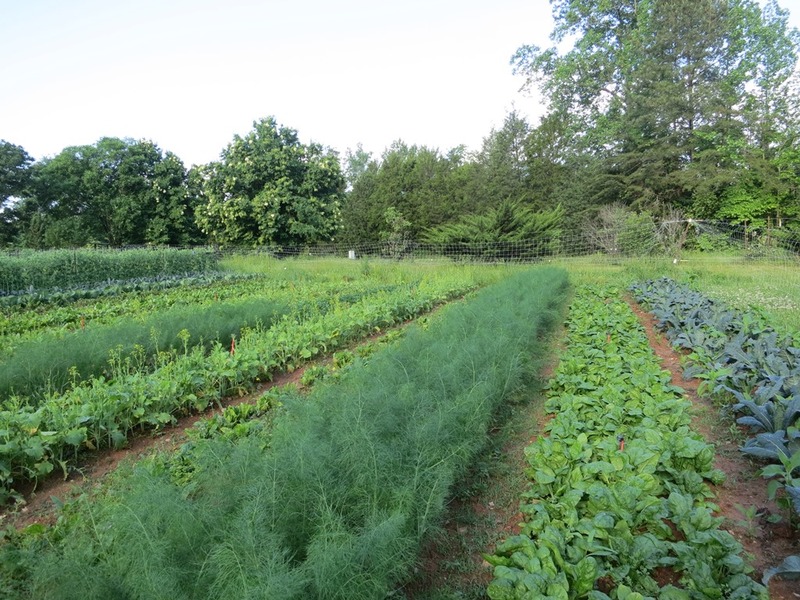 RAFI is one of the keystone organizations in the movement and has been working on the issues of fairness and farm sustainability since the 1930’s, tracing their roots back to the National Sharecroppers Fund. This small group has had far reaching impacts on fairness in contracts for farmers, literally writing the legislation for the National Organic Program and other farm bill provisions, saving hundreds of family farms from foreclosure, issues of rural poverty and hunger, preserving the rights of farmers to save seed and develop new varieties, farm worker’s rights and more. The work is so important that anyone who eats should donate to RAFI. Betsy and I have worked with them for nearly 20 years and continue to be amazed at what they do; I am honored to be the current Board President. The lettuce is perfect right now, almost too many to choose from; we have Green Boston, Romaine and Hearts of Romaine, Red Leaf, Green Leaf, Red and Green Oakleaf and the crispy and sweet Little Gem. Lots of Spinach, Baby Swiss Chard, Lacinato Kale and Collards for greens. The chicory family is coming on with Escarole, some Sugarloaf and Red Radicchio and Dandelion Greens. Green and Red Spring Onions. The first Basil along with Cilantro, Dill and Italian Parsley. Easter Egg and Red Radishes in the roots and some Turnips but we are having trouble with the yellow margined leaf beetle. Cucumbers! More of the ethereal Poppies! Peonies. Dutch Iris in blues. Bachelors Buttons and Sweet William. Asiatic Lilies. Beautiful spring Bouquets. Am so happy to get updates from you all and am also so appreciative of the work you are doing with organizations that mean so much to our precious world…..thanks again for all you do…..